Two hundred members of the New York Guard, the state’s volunteer state defense force, are conducting their week-long annual training at Camp Smith Training Site August 6-12. 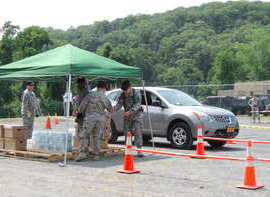 The New York Guard is a force of 500 uniformed volunteers, organized as a military unit, who augment the New York National Guard during state emergencies. They provide administrative and logistics support to the National Guard. During the week-long training session members who are new to the New York Guard will go through an initial entry training program and current members will conduct primary leadership and officer training. New York Guard engineers will also be involved in construction projects at Camp Smith. The New York Guard will celebrate its 100th anniversary this month. When the 24,000 members of the New York National Guard were mobilized to fight in France in 1917, the state created the New York Guard as a state militia to replace the National Guard. National Guard Soldiers had been guarding railroad bridges, the New York City water system, and the Erie Canal to prevent sabotage by enemy agents and state officials want to replace that force. Eventually there were 10,000 New York Guard members across this state with about 2000 serving on active duty as a security force. During World War II the New York Guard was created again, and in the 1950s the New York Guard was established as a permanent force.